Vintage From Paul is delighted to offer these Sunoco American Wildlife Wild Turkey Highball Glasses. 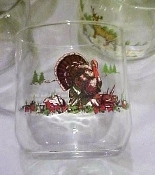 The clear glass is decorated with a a Wild Turkey on one face and information & facts about this bird on the other face. Each of the available Sunoco American Wildlife Wild Turkey Highball Glass is in mint condition. The graphics are crisp, the colors vibrant. The Sunoco American Wildlife Wild Turkey Highball Glasses stand 3-3/4 inches in height, measure 3-1/8 inches in diameter at the top. These Sunoco American Wildlife Wild Turkey Highball Glasses would be wonderful pieces to add to your bar or collection.